I have four adorable pooches, so I know that keeping a home safe for pets is no easy task. I’m also involved with Rescue Village and I’m very passionate about helping orphan dogs find a loving home. My work with Rescue Village has made me realize even more how important it is to educate owners about pet-proofing their homes. There are no shortcuts to it. You have to get on the ground (literally) and carefully inspect your home to spot potential hazards. You then have to make sure to remove, or at the very least, minimize these hazards. Your pet’s eye level, that is. 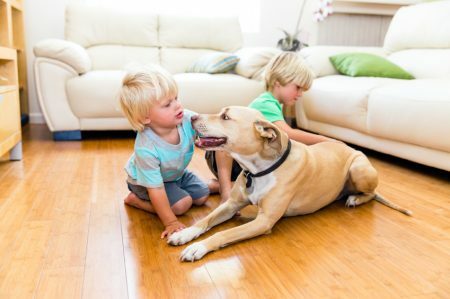 Animal experts suggest getting down on all fours to get a good view of what your pets see. Watch out for cables, plants, window cords, and other things around the home that could catch your pet’s attention. Pets (particularly teething puppies) love to chew on soft wire, which can cause burns and electric shocks. Damaged wire can also be dangerous to your home. Tuck power cords away, and firmly tape down those that can’t be hidden. Unplug unused cords, and cover power strips and outlets. Pets also love playing with window cords – they can get tangled in them and this could lead to strangulation. Make sure window cords are short enough to be out of your pets’ reach. Inspect the floors. There could be small toys or other objects that your pet could swallow, resulting in choking or indigestion. If you have indoor plants, make sure they are not toxic to your pets. Mistletoe, lilies, chrysanthemums, and others have been found to be poisonous to pets. Lily leaves, in particular, can cause kidney failure in cats. Watch out for toxic household products like detergent, bleach and antifreeze, and store them somewhere your pet can’t access. Antifreeze poisoning is known to kill around 10,000 pets each year. And in the same way you keep medicines and supplements away from children, make sure they are out of your pets’ reach too. What could be dangerous to kids can be dangerous to pets too. Areas around the home, like the fireplace, heater and open dryers have to be closed off to pets. This goes for open windows and stairwells as well. Swimming pools should also be kept off-limits unless your pooch is supervised. Keep your pets away from human food. Many of them can be very harmful to animals. Ingestion of chocolate can cause seizures, diarrhea and even death. Grapes and raisins contain a toxin that can damage animals’ kidneys. Xanthines in chocolate, tea, and coffee can damage your pets’ urinary system and nervous system, and can also cause heart muscle stimulation. Food with high sugar, salt, and fat content can also cause various illnesses. Ideally, pets should stay inside the house, but if this does not work for you, then you have to create a comfortable outdoor home for them that will protect them well from the elements. Avoid toxic plants in your landscaping, and keep the trash away to prevent your pets from ingesting toxic items or choking hazards.